viriss The effect's controller decides. It's essentially saying "this is a creature without power and toughness until it has a +1/+1 counter on it." Also, figured I didn't need the swamp reminder text, though I guess it is always printed, even if it's a bit simple. Thanks for the win! It often costs you more than a mana to get +1/+1 counters onto something, so I thought it'd probably not be too broken and have sorta negative returns. Might still have some broken combo's, but none that I can 123 think of. Anyhow, the next challenge: Create a land that likes it when you control one or more basic lands. Easiest example would be something like Sunken Hollow or sortakinda Drowned Catacomb, but you can go anywhere you want with it. Garden of Origin enters the battlefield tapped. : Until end of turn, whenever you tap a basic land for mana, add one mana of any color that land could produce. Free of complexities, nature is allowed to thrive. Haunted Manor enters the battlefield tapped. 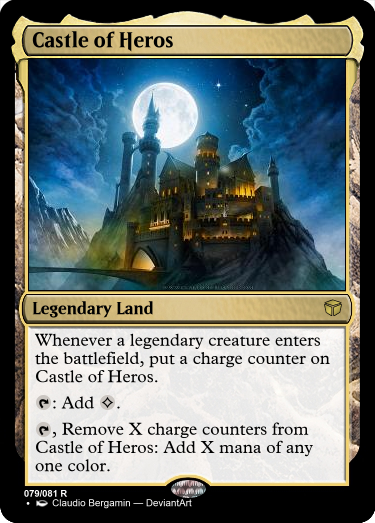 Domain -- , Sacrifice Haunted Manor: Search your library for a number of basic lands equal to the number of basic land types you control and put them onto the battlefield tapped. The fools never understood, even as the manor lay sacked and dormant, that the real power was underneath it. I'll be judgin in about two hours. Be quick if you wanna join in or change something. The name is pretty fitting for what it does, and what it does is pretty strong. Possibly too strong. In the right deck, this has the possibility of giving five mana on turn three/four with dual lands and Nylea's Presence or Prismatic Omen. However, that is pretty hard to get, needs a multicolored deck built around it, and then it only gives five colorless mana for a probably all-colors-utilizing multicolor deck, while also costing you a land-drop. So balance-wise it miiiiight be fine, it just needs to be tested. I like it. Making this legendary is very correct as multiples would be devastating. Thing is, it's still quite devastating. 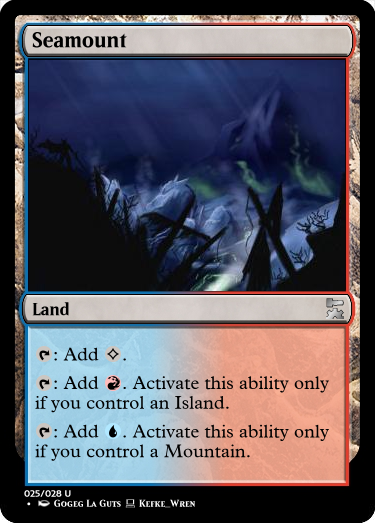 Doubling mana from lands is an ability that's usually left for at least 5-drops. Putting it on a land is way much, even if it only works for the one turn it's tapped. I actually didn't know of Nimbus Maze until you said there were others. There should totally be more lands with this ability. They fill a void if you play two colors but have drawn only one land-type. Kind of strange that you made it uncommon even though the original is a rare. I'd personally prefer it that way as more people could play the card that way without paying 10 bucks, but I'd like to hear your take on this rarity change. Also, good name. I'm very doubtful about this card not being too powerful, as it gives a lot of lands: turn three you might end up with like 6 or 7 lands on the field. It also enables more Domain as you can search for missing basic land types. I do appreciate that the land itself and that the lands it fetches come into play tapped. Also, I wonder why you named the land the way you did. TBH, I think the rarity was just an artefact of having originally based it around a different land before remembering Nimbus Maze. 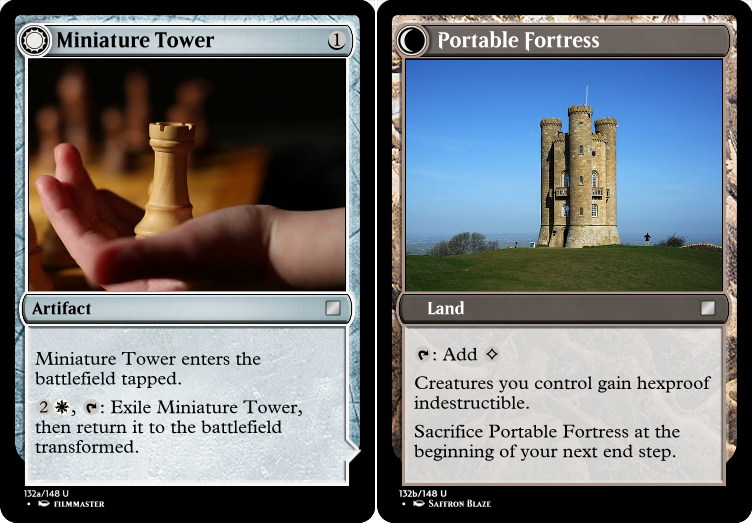 However, I would also say the maze was a bit of a junk rare - which is not to say that it's a bad card, but it does require a bit more setup than even the other checklands. So having it in Uncommon probably would have been more in line with other cards (much as I personally hate how often the rarity system creates $$$$ = Power). As an aside, I think the best place you could use the land viriss made would actually be an artifact deck, where mana colour doesn't matter, alongside cards like Draco, Manaforce Mace, and Prismatic Geoscope. Those are understandable reasons for changing its rarity. And that was an error in my judgement, viriss' card is quite a bit stronger than I first thought then. Oh well. Design an artifact that can transform into a land. Ex. Golden Guardian and Treasure Map are good places to start. An artifact that becomes a land, you say.... Okay, how's this? Whenever Earth Compressor deals combat damage to an opponent, exile target land that palyer controls. Then, if there are three of more cards exiled with Earth Compressor, transform it. 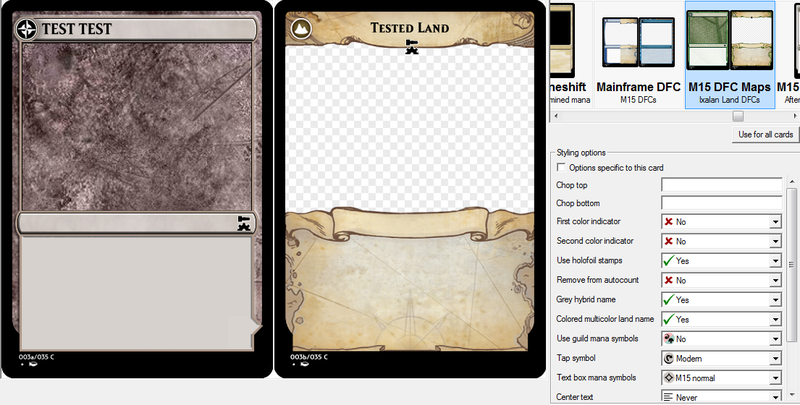 , : Put a land card exiled with this permanent onto the battlefield under your control. Is there a template for the Ixalan fliplands? Thanks kefke! Is there a template for the Ixalan fliplands? Sure is. Can't remember off the top of my head which package it was in, though. 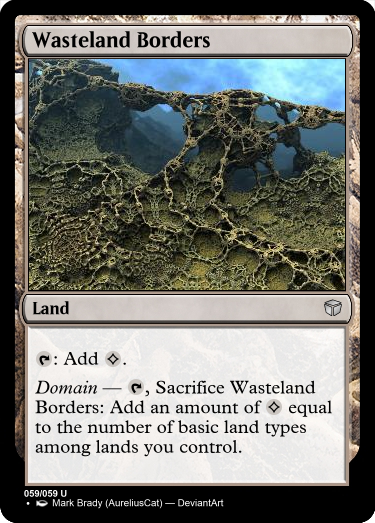 The "M15 DFC Maps" template does just the fliplands, but the "Mainframe DFC" template is more flexible, and can do a lot of different card types on either side. 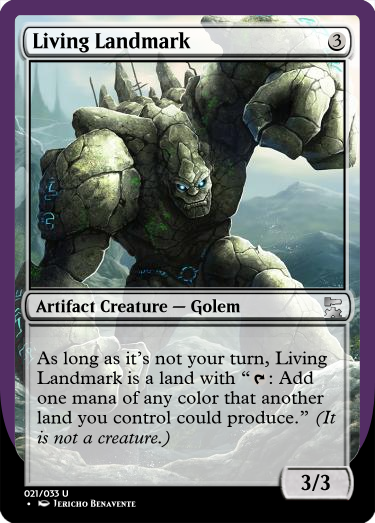 Just wanted to make a mana-rock turning into a land. At the beginning of your upkeep, put a charge counter on ~. Then, if ~ has 3 or more charge counters on it, transform it. : Add for each charge counter on ~. Ever so slowly, the rocks tumble through the fertile soils, set for their next destination. , Remove a charge counter from ~: Add one mana of any color for each charge counter on ~. If ~ has no charge counters on it, transform it. With the lands desiring their nutrients, they come to a halt, anticipating their next tumble. Couldn't find good art for both sides unfortunately. kefke I like this one. It could be a great staple in the right set. Jartis Pocket castle!! "have hexproof and indestructible". FLAREdirector The land side "choose two" seems a little powerful for 3, but the cost to get there is good. Though that transform trigger is easy, I'm glad you added the "and tap it." Flo00 Land destruction is tricky, and this is repeatable. Strangely, I feel like the Juggernaut "attacks each combat if able" would help. And I like that it just turns into a nice place to live. "Here's one mana." melono I like the build up/drain down, except the last time you use the land side you don't get any mana and *then* it flips back over. I'm really happy with my design for this round, and I appreciate the feedback. My intention here was that I didn't want another card that transformed once and that was it. I wanted something more adaptive than that -- so why not a card that you can transform based on what's more useful to you in the moment? Also, I'm a sucker for Pirate synergy. "Normal" Magic gets too much love. Now it's time to get weird. Create a land designed for Commander, Conspiracy, Two-Headed Giant, or Planechase. : A player of your choice adds one mana of any color they choose. Activate this ability only during your turn and no more than three times each turn. Tap Common Grounds. Spacial Fold enters the battlefield tapped. : Add . 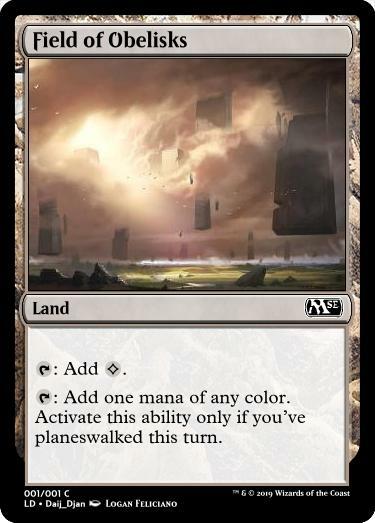 If a player planeswalked this turn, add one mana of any color instead. , : Roll the planar die. It allows a reroll planar die at a cheaper mana cost if you've already paid six mana this turn, but more importantly it gives you instant-speed access to the planar die, although at a pretty steep cost. Draft Forgotten Well face up. 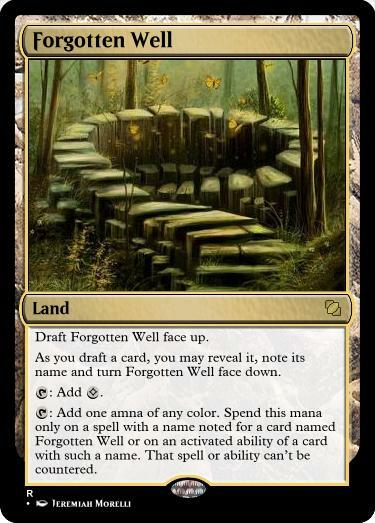 As you draft a card, you may reveal it, note its name and turn Forgotten Well face down. : Add one amna of any color. Spend this mana only on a spell with a name noted for a card named Forgotten Well or on an activated ability of a card with such a name. That spell or ability can’t be countered. I should technically wait another day, but there hasn't been any activity since the 13th, so how about I don't keep everyone waiting any longer? Daij_Djan - This is a pretty simple and elegant design. It has the potential to give mana fixing for free or at-cost, but statistically will be unreliable, which probably makes it coming in untapped reasonable. Though it's hard to say in any given game whether the secondary effect will end up being more or less severe than, say Grand Coliseum, I'd say that on average it probably would be more. It's a worthwhile gamble, though, and there's not many good ways to lessen it. FLAREdirector - While not tied to any specific format, this would be phenomenal in Two-Headed Giant. Possibly too good, since it let's you loan your partner three free any-colour mana each turn. I notice, though, that it says "A player of your choice" and not "Another player", which means you can use it on yourself. That pushes the power level up a good bit in my estimation. viriss - Another card not explicitly tied to a format. I'd assume this one is meant for Commander, where you'd have the most reliable source of legendary creatures to charge it, and not care so much about being limited to one in play. Definitely has the potential to net you an extra commander play in the late game, without slowing tempo up to that point, but I'm not sure about long-term viability with this trick. Also, did you mean Heros as a name, or was it a typo on "heroes"? 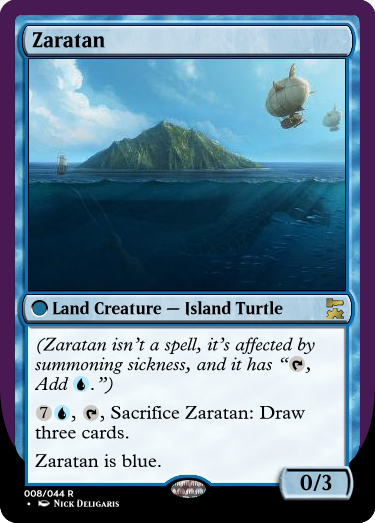 Jartis - This does a lot of what the first entry was doing at common, but with enough extra going on to justify the upgraded rarity. Loss of tempo is a good tradeoff for a mana fixing condition that can be hit on other turns, and a decently strong secondary effect. Flo00 - Cavern of Souls was a favourite for one of my old decks. This is an interesting take on it. Less versatile, but it has the potential to enable some really nasty plays. Though, on the other hand, draft is fickle, and it has just as much potential to fizzle and do nothing. Also, as much as I think draft-focused cards are cool, they have "the draft problem", where unless everyone agrees to return their cards to the pool to be drafted again, they can only be used for one play session in a physical format - but I don't count that against individual cards. Some really close competition this time around, and I went back and forth over which card to pick for a while, but in the end, the winner is Jartis! I super did not think of that, actually. That should NOT be the case. Can't believe I didn't catch that. That's pretty understandable, really. When you're making the card, you know what you mean, so it's easier to miss faults in the wording. There's a famous example of Time Walk making it to playtesting with the wording "Target player loses next turn." kefke Thanks for the win! One of my favorite cards is Dryad Arbor, and of course cards like Celestial Colonnade go for a pretty penny, even after being reprinted. So the new challenge is to design a land that is also a creature, at least some of the time. Note: your card doesn't have to take the same approach of either of the examples, as long as it fulfills the criteria. I'd even accept a design similar to Arixmethes, which is a creature that's sometimes a land. I knew what I was going to do with this as soon as I saw the challenge. The turtle with an island on its back has been a creature engraved in my consciousness for a long time. I could have just picked some appropriate P/T for a turtle, and maybe thrown on Defender. I wanted to do more with it than just "blue Dryad Arbor", though. So I decided, like Dryad Arbor, to start with a CMC 1 creature at common and "upgrade" it for being a land...and since I was adding mana generation on top of what it already has, I upgraded Shore Keeper all the way to rare. That's balanced, right?